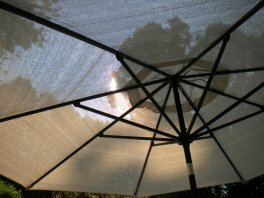 Patio Umbrella Fabric - Sunbrella or Coolaroo Fabric? Patio umbrella fabric comes in a wide range of quality, price and colors. Should you go with a cheaper olefin fabric or a more expensive long lasting Sunbrella outdoor fabric? First lets talk practical. Here quality and price go together. A polyester, thinner, and less expensive fabric might work if you are careful about putting the umbrella away when you're not using it and storing it during your off season months. 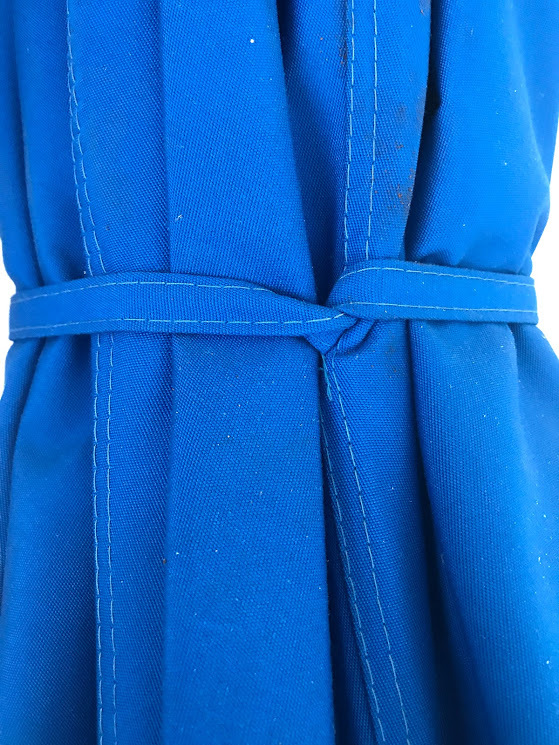 A more durable fabric is better for those of you (like me) who will leave it out in the hot sun and rain full time. In this case paying more for a better fabric that doesn't fade and lasts longer is the smart choice. Check to see what kind of venting is found on the top of the patio umbrella. Venting is quite an important feature - some have none and other outdoor umbrellas will have single or double venting. 2. Venting provides stability to the umbrella. If a sudden gust of wind comes up the umbrella won't tip or become damaged. 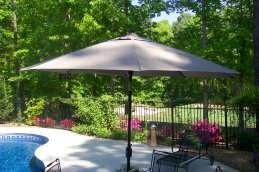 Consider a Sunbrella patio umbrella when you are ready to purchase or replace your pool umbrella. There are lots of reasons why this outdoor fabric is worth the extra money. 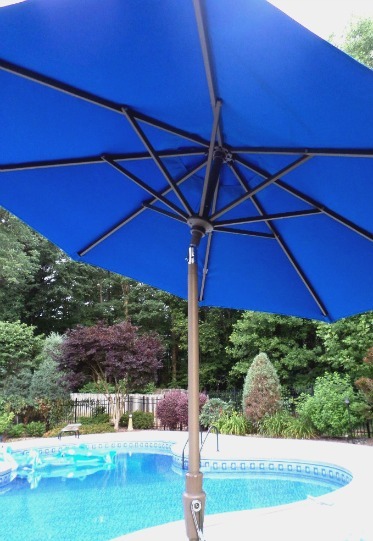 We have had our Sunbrella pool umbrella for several years and leave it outside spring, summer and fall. We lost our shaded backyard after taking down 20 some trees. With all the big trees gone we needed to provide shade around the pool with outdoor umbrellas. Having owned a boat for many years, we were familiar with the Sunbrella name and their reputation for high quality outdoor fabric. This fabric company has been in the boat and awning fabric business for 30 years. This outdoor material is well known for its durability and fade resistance qualities. Thicker fabric and a tighter weave that means it doesn't need replacing for several years. We leave ours outside for several months. A 5 year warranty against fading. No other patio umbrella fabric offers this protection. That includes people like us who leave our pool umbrella outside all year round. Less light comes through Sunbrella fabric compared to olefin or other fabrics. This outdoor fabric blocks the sun and provides excellent UV protection. 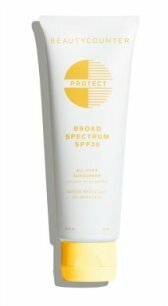 Depending on what color you choose - it can provide up to 98% UV protection. Light colored fabric provides a little less UV protection than darker colors. The tight weave means that if there's a little drizzle you will stay dry under the umbrella. Even better is that it protects some of our pool furniture as well - the outdoor chair cushions stay reasonably dry and protected. 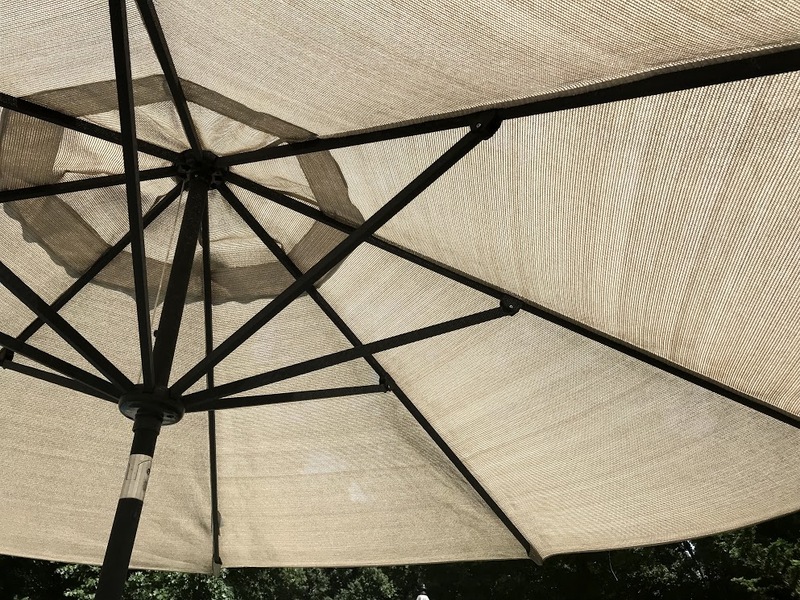 We noticed that the wrought iron patio table that was protected by the Sunbrella patio umbrella had less rust even though it was several years older than our newer wrought iron table that uses a Coolaroo umbrella. Using a solution-dyed acrylic, you will find that there is no fading (even with red outdoor umbrellas) and the fabric retains its color even after years of sitting out in the sun and rain. If you plan to keep your umbrella outside most of the time, the hot sun can fade less durable fabric. 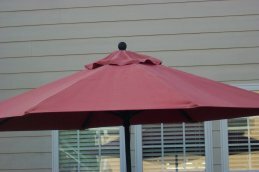 My daughter purchased a patio furniture umbrella in a deep red using another type of outdoor fabric. It faded in one season. Mine still looks like new after 4 years. 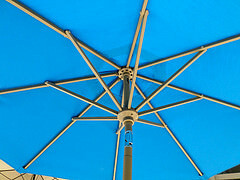 A Sunbrella patio umbrella is a high quality outdoor umbrella. The fabric keeps its color and doesn't fade even after years of exposure to the sun. This outdoor fabric has a protective finish that makes it stain resistant. A flowering tree stands nearby and drops it's dark pink petals and later leaves onto the top of the umbrella. Even after rain the wet petals and leaves do not stain or leave any marks. 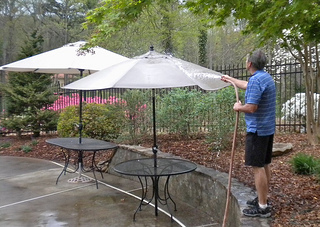 Just hose off your Sunbrella umbrella with a hose and the debris, dirt and leaves come right off with no stain marks. 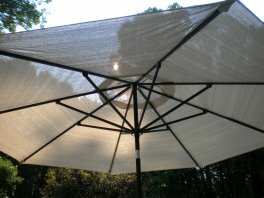 Living in Georgia, we have lots of humidity in the summer, I also wanted to find a patio umbrella fabric that was mold resistant. The protective finish is water repellant so that when it rains the water beads up on it which prevents the mold build up. The fabric breathes and is quick to dry. We purchased our Sunbrella umbrella on line. We got it with free shipping and it was delivered really quick - just a couple of days after ordering it. If you want a patio umbrella that you can leave out and still have it look like new, year after year this is the one to get. Because of the special treatment of this outdoor fabric, these patio umbrellas are more expensive. The good news is that the fabric keeps looking great for a long time so you don't need to replace it as often. Here is a picture of my daughter's patio umbrella that is not made of Sunbrella fabric. It was a deep red when she bought it and within one summer it had faded to this color. Her faded patio umbrella fabric convinced me to pay more for a Sunbrella patio umbrella. 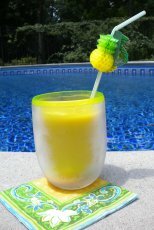 Coolaroo fabric is a great option for your pool umbrella. How would you like an umbrella that can actually help to reduce the temperature making it more comfortable for you and your guests? This fabric can do just that. Not only is it very durable, but it offers a unique design that allows the fabric to breathe which then reduces the temperature of the air under the Coolaroo umbrella. What's so "cool" about this fabric is that it blocks out UV rays, but still allows any cool breeze to pass through to keep you comfortable (especially if you live in hot climates like Florida, Texas or Arizona). This high quality outdoor fabric has a unique design - the fabric has millions of tiny spaces that allows the fabric to breathe and for the air to flow through. What this means to you is that the temperature beneath the Coolaroo umbrella can be as much as 32% lower than the temperature in the direct sunlight. If you are looking for large patio umbrellas, you can get a Coolaroo umbrella for much less than a Sunbrella patio umbrella. We purchased an oval patio table that seats 6 people. The recommended patio umbrella size is an 11' umbrella. 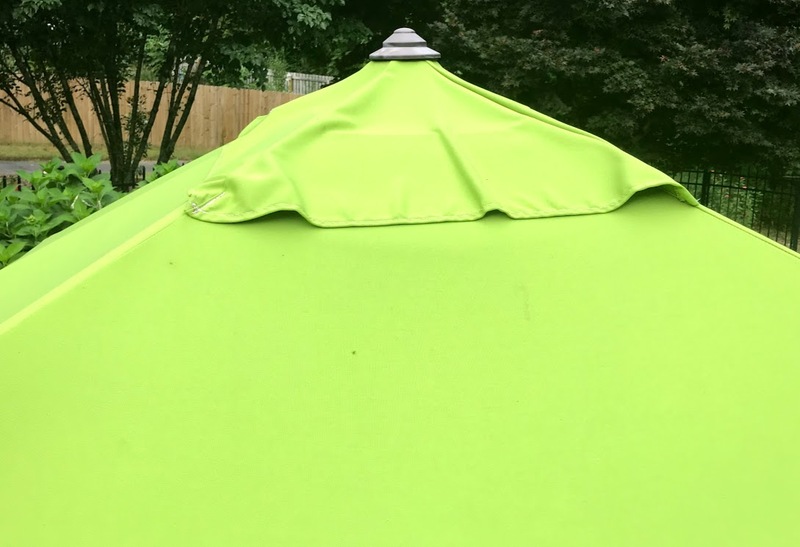 Originally, I wanted to match the same color and fabric of our 9' Sunbrella umbrella - until I found out the cost. The cost of an 11' Sunbrella umbrella was just under $400. I purchased the 11' Coolaroo fabric umbrella for less than $125. 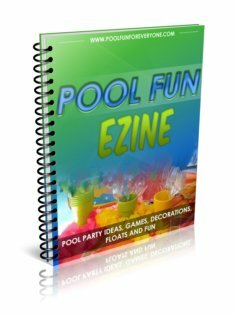 We had a big 4th of July pool party with 40 people. The afternoon was warm, in the high eighties. Guests were seated under the Sunbrella umbrella and others under the Coolaroo umbrella. I asked for the opinions of those sitting outside, if it did feel cooler under the Coolaroo umbrella than it did the Sunbrella one. So each person sat under the Sunbrella, which is a tighter weave and a heavier fabric. Then they sat under the Coolaroo umbrella which is a more open weave and breathable fabric. 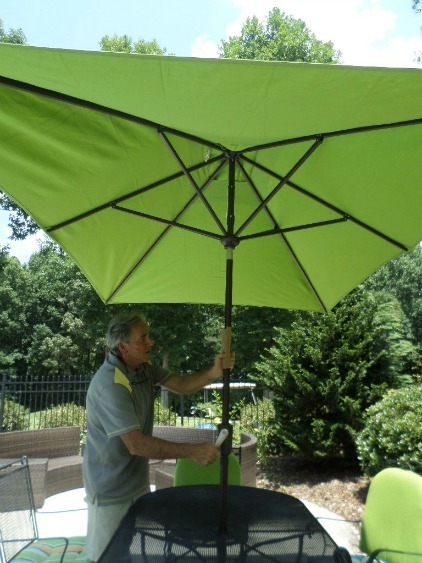 The Coolaroo allows for more air movement, whereas the Sunbrella umbrella keeps the heat "in." Everyone agreed that indeed, the Coolaroo fabric was a bit cooler and more comfortable than the Sunbrella umbrella.